I've been waiting for these to be released. I quickly bought them once they were out on display. I had such a pleasant surprise, since with all my stalking of blogs, I only noticed there was 6 but this display had 8!! So, even if one was yellow, I quickly scooped them up to show you! Of course after I googled the names, the brand website came up (duh! - Why I never check official websites is beyond me...) hehe anyway...from what I gathered .... That's What I Mint (the dark teal) and Lemon Lolly (bright yellow) are Shopper Drug Mart exclusives!!! Super excited, an exclusive? wow!! Click to see many more photos! A short overview about them. Although 6 out of 8 of them are simple glitter mixes, they carry alot of sparkle in them and aren't duds like how I found OPI Vesper. Even without the bigger glitters, they are still quite gritty. 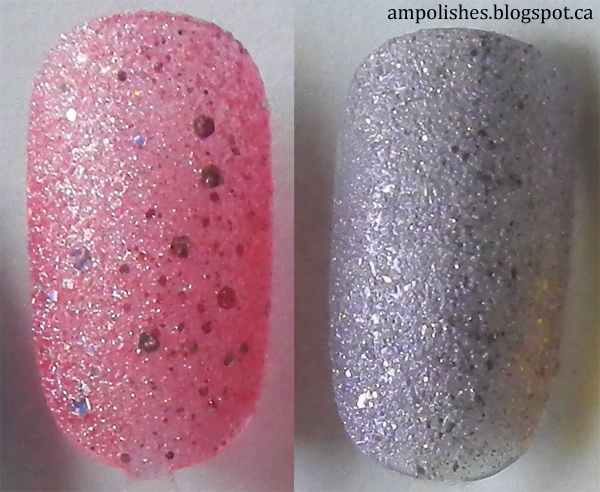 Candy is Dandy (pink) has a glitter mix similar to the OPI Mariah Carey ones (my favourites!!!!) - making it the grittiest. The other one, I Lilac Gumdrops (pale lilac) has additional yellowy - silver glass flecks in the glitter mix, although it has no impact of the level of grit, it dries paler than in the bottle. Below are close-ups of the two. Surprisingly, I cannot choose a favourite!! I Lilac Gumdrops was deemed a favourite when I first saw the press photos BUT Cinna-man of My Dreams & Lemon Lolly were both unexpected hits, and the rest I just love the pigmentation!!! oh please don't make me choose! A-nise Treat - simple black and silver glitter mix, opaque in 2 coats & good grit. It dries to a washed out black, I don't have anything negative or positive to say about it, it's just nice. I will definitely wear it but not like I want to show it off! Blue-berry Sweet On You - simple pale silvered-blue, pink and green glitter mix, opaque in 2 coats & good grit. It's very subtle to me but has the best colour combo. I love to wear shades like this so it gets two big thumbs up from me. Candy is Dandy - has the best glitter combo with pink micro glitter and 2 sizes of holographic hexes, sheer but opaque in about 3 coats & very good grit! Only one with this type of mix - sad since it's my favourite! I still can't really get over how pink looks with my skintone haha..
Cinna-man of My Dreams - simple glitter mix of a brownish red, pink and orangey gold...also reflects bits of blue or silver (maybe??) haha the more I look at it, the more I like it and the more colours I see.. sometimes I don't know if my eyes are playing tricks on me since I'm staring at it so hard !! It looked meh in the bottle but on the nail, I love it!! such a me colour!!! Opaque in 2 coats w/ a good grit. I Lilac Gumdrops - a lilac glitter mix w/ a bright purple shimmer and yellowy silver glass flecks. I prematurely claimed this as my favourite but as I went on testing the rest, it's still great but not my #1 favourite. It's a bit sheer also but opaque in about 2-3 coats - 2 being still a bit sheer but passable while 3 is more opaque. It dries a bit paler than the colour shown in the bottle BUT the purple shimmer does shine through which is very interesting. This also has good grit like the rest. Lemon Lolly - It's a simple golden yellow glitter mix that reflects a really strong yellow shimmer and orange amongst a strong gold-yellow. Anyway, it is very pigmented and bright. Opaque in about 2-3 coats, 2 being still a bit sheer but passable while 3 is more opaque and makes me feel less paranoid about seeing my VNL. It dries to a nice grit and it's definitely a sleeper hit! I know, I'm giving thumbs up to a yellow -- go figure. ps. I think if it had holographic hexes it would be even better! My Cherry Amour - Simple cherry red/pink glitter mix sprinkled with holographic sparkles. It's quite pigmented and bit more pink on nail than seen in bottle. It was opaque in two coats. It's dark enough that it doesn't look horrible on my nail and I think it's quite a match w/ That's What I Mint. That's What I Mint - Simple glitter mix with blue, a brighter blue, greens and golds. It's a very common yet lovely mix. It is super pigmented, perfect in two coats. It's nothing like mint as the name suggests, but I forgive that because it's SUCH a pretty teal. I actually wore this for a manicure and it only had ONE chip after 4 days!! MOAR pictures :) All swatches are 2 coats except Candy is Dandy which is 3. 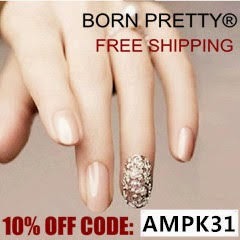 These polishes were bought by me, my opinion was not affected in any way. Do you like this trend of liquid sands? How do you like the exclusives? What a gorgeous mix of colours. The pink, teal and yellow are so vibrant -- YUM. I would love to see Cinna-Man of Your Dreams IRL too. LOVE THESE!! I have a few but I NEEEED THOSE exclusives! lolol I told hubby we need a trip to Canada now! Thanks for showing !! You are crazy gurrrl, I have never bought an entire collection before!! Yowza! pretty! need to pick the blue one up... looks amazing!